that make this winter the perfect time to explore climbing. Stronghold gift certificates can be purchased online instantly or picked up in a gift envelope. The Stronghold is located at the Brewery Arts Complex in Lincoln Heights, inside the California Edison Company’s Los Angeles #3 Steam Power Plant (Los Angeles Historic-Cultural Monument #388). 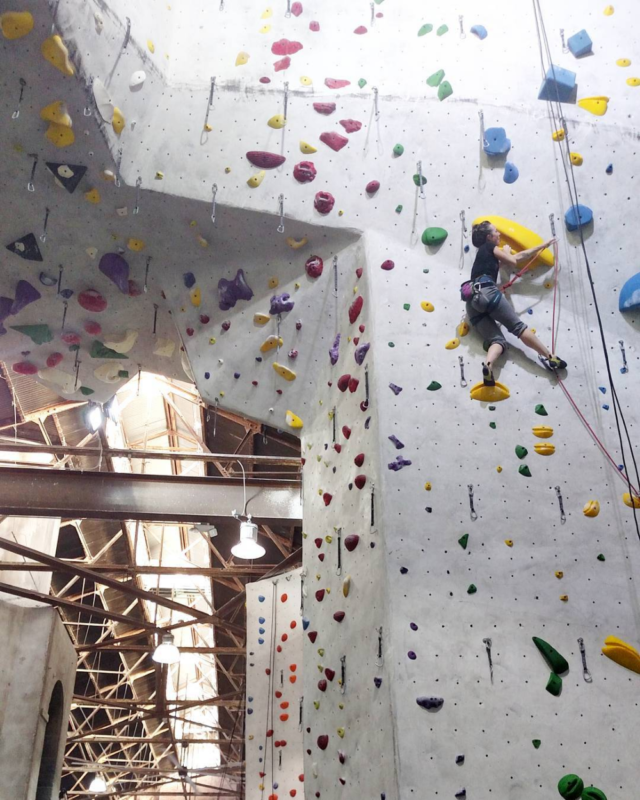 The gym features bouldering, top-roping, and lead climbing, on walls up to 45′. 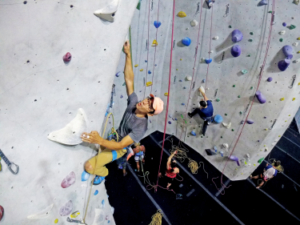 Hundred of problems and routes challenge everyone from beginners to expert climbers. A 2000 square foot fitness area, yoga classes, saunas and showers complement the climbing terrain. A retail area stocks climbing equipment and guidebooks to the best climbing in California and beyond. Never tried climbing before? You can get started on your first visit with bouldering (climbing on lower walls above pads) and using the gym’s five autobelays (devices that manage the rope for you, allowing you to climb walls up to 40′ after a brief orientation). The rates for a day pass are $25 ($20 on weekdays before 3 PM). You can rent equipment for $5 (climbing shoes, harness, and chalk bag); complimentary towel service, yoga mats, and yoga props are provided. Want to expand your climbing skills, or refresh skills that you haven’t used for awhile? The Stronghold offers many classes, including the 90-minute Intro I, which will prepare you for roped climbing. The Stronghold also offers memberships providing unlimited climbing and yoga for just $79/month, with a $65 initiation fee. Membership includes a free member guest pass every month, free gear rental for the first month, free Intro I class, and access to free member clinics and events. There is an Intro to Climbing Package to help you get started as well.